The football shirt on its own has taken on extra meaning in the past 25 years. Since Gazza wiped away his tears on a pitch in Turin with the corner of his shirt, and the subsequent launch of the Premier League, shirts have become the item fans want in their wardrobe. Get it right and it becomes a fans’ favourite. Get it wrong and you can look like you had an accident in a paint factory. Be thankful if you can actually see this image. Owning a football shirt is a rite of passage for many young men. It’s been called a ‘stage of life’ previously on TNG and features a young blogger in full Umbro attire. I believe this style is commonly known as the ‘full kit wanker’ look (Ed: OUCH). 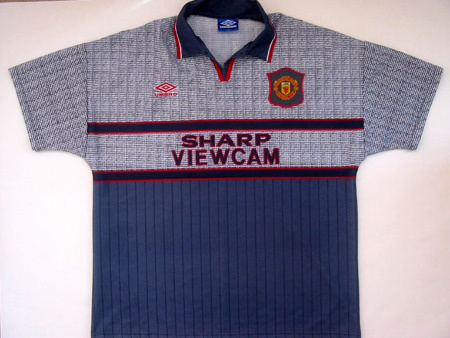 It could have been worse for TNG: He could have invested in the infamous grey jersey which made MUFC more invisible than Action Man in full camo gear. Whilst many fans have a particular shirt they adore (reminiscing about past glories, for example), these can also indicate a man with a Peter Pan complex, so it is important to know your own limits. Nobody is looking for high fashion in these garments so feel free to go for a looser fit – especially in the era of ultra-modern kits containing more Lycra than a Mr Motivator outfit. Was anyone brave enough to wear the Cameroon onesie from a few years ago? There is always the option of gaining attention through shock value. Let’s be honest, wearing a kit is a declaration, with you proudly pinning your colours to the mast. It is about picking a side and eliciting a reaction in friends, family and opposing fans. The beautiful game needs beautiful shirts for its beautiful players. Usually they go hand in hand. As clubs look to extend their marketing reach it can often come at the expense of the fans. Currently, Hull City are sponsored by Flamingo Land (the Yorkshire amusement park which has raised a few eyebrows) and a few years ago Papiss Cisse refused to wear a gambling sponsor on his shirt on religious grounds (before he was allegedly ‘papped’ at a casino). You only need to look at recent seasons for other fine examples of marketing nonsense. Being branded in shirts described as ‘African violet’ (like Reading) or players wearing a sash resembling a high school prom queen (Spurs, I am talking about you) or changing team colours (Cardiff City). This is not a new phenomenon, as Man City fans and their deck chair look circa 1993 will tell you. Yet all of these are fine examples of what not to wear outside. You can see that big companies look upon a clubs history to forge a bond between club, manufacturer and fans. Simple kits with bold colours crate a strong look. If the 1970’s and early 80’s did one thing right in British Football it was that the kit design was minimalistic, which makes retro kits such good value for money now. The simple rule for shirt purchases here is: If Ray Wilkins had hair then you’ll probably want to buy it. Bald? Back away. If you need further help, companies such as Toffs reproduce brilliant slices of nostalgia for you to own. I decided to write this after attending a family get together. An extended family member decided that his team shirt (in bright blue with cream chinos and an ill-fitting red blazer) looked the part. As anyone who has visited Stamford Bridge, Anfield, The Etihad, Emirates and especially Old Trafford knows, this is a sure fire sign of a prawn sandwich-loving douchebag. 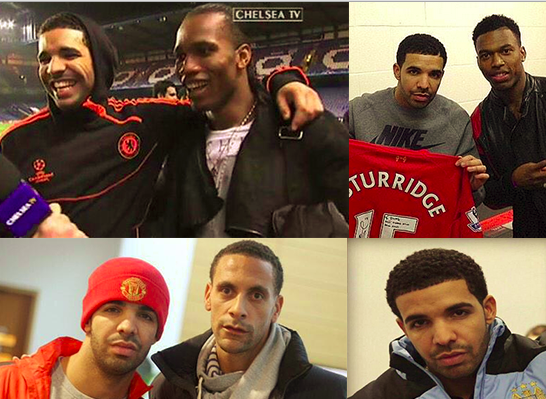 The football shirt and blazer combo has become the tell-tale sign of a bourgeois bell-end who will know enough to get through 90 minutes of a game but, like well-known singer Drake, he would switch his team colours if a better offer came along. It’s fine to relive your youth – but there’s a time and place for that. Pre-match drink? Fine. At the ground? Fine. Armchair fan at home? Fine. I am addressing those who would be tempted to wear the shirt to another occasion. Alan Partridge wearing a jacket emblazoned with a Castrol GTX logo to a funeral is funny because it is on television. Wearing football colours surrounded by grown-ups at a real-life event will get you ridiculed. If you must wear your team shirt it is important to keep it simple. Nobody wants to see too much skin. Similarly, please keep an eye on ensuring your shirt has not ridden up above the belly button. Finally, if you are in Newcastle and reading this you may need to Google what a football shirt is since 55,000 of you seemingly turn up without one in your hand to swing around your head. If you branch out into other team shirts the simplicity of Dutch and Arsenal home kits throughout the years cannot be overlooked and whilst it might be stereotypical to say the Italians have great fashion sense, a quick look through their history shows they pick simple, yet stylish, shirts. It’s likely that some, if not all, of you have or have owned a replica jersey, worn it with pride and felt that the latest shirt technology has given you the extra edge to score a goal. Perhaps you wore it in the back garden and volleyed a ball through the green house. We are taking nothing away from that. Embrace it. Go through that rite of passage. Show your team some sartorial support but try to do it in style!